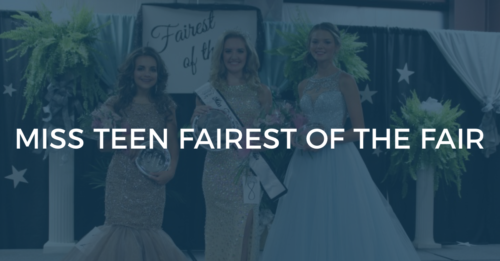 The Miss Teen Fairest of the Fair Pageant (ages 13-15) will be held under the Smith County Ag Pavilion at 8:00 p.m. on Monday, July 2, 2018. Contestant must reside in Smith County full-time. Entry fee is $25. Pageant staff reserves the right to ask for proof of residency. NO REFUNDS. Entrant is and always has been a female and is between the ages of 13-15 by the date of pageant. Pageant staff has the right to request proof of age. Resident cannot qualify to compete if she is married, ever been married, is pregnant, ever been pregnant or been convicted of a felony. Winner must relinquish crown if she gets married, gets pregnant or is convicted of a felony during her year of reign. Dress must be floor length. Judges will strongly consider contestant’s make-up and dress. Contestant needs to “look their age”. Entrant will continue to be a person of good moral character, affirms that she has not committed and will not commit any act inconsistent with the highest standards of public morals and convictions or that reflect unfavorable on the Smith County Fair Pageant, its representatives, sponsors and/or the county. Deadline for pageant entry is July 1, 2018 and entry must be post marked by July 1, 2018. Contestant, parent, and/or legal guardian must agree to abide by all pageant rules, regulations and must sign release form. Winner will be REQUIRED to attend some fair events and REQUIRED to make appearances during her year of reign. Appearances are at the discretions of the chairperson and/or executive board member/s. Winner cannot make appearances without the consent of pageant director and all appearances are at the discretion of the pageant director and/or executive board member/s. There will be a Most Photogenic. The entry fee is $10. Photo MUST be a 5×7 or smaller. Submit photo with entry or bring photo the day of pageant. Photo will be returned the night of the pageant. Fees are due by the deadline July 1, 2018. EXACT CASH or TWO CHECKS (if you want to be in photogenic). July 1, 2018 will be an OPTIONAL day to come and practice on stage before pageant at the AG Center from 1:00-3:00pm. ENTRY FORMS are available online and available for pick up at the Smith County Register of Deeds at 122 Turner High Circle, Suite 113 (Turner Building), Carthage. For more information, please contact Pageant Director Megan McDonald at mcdonald@hotmail.com. 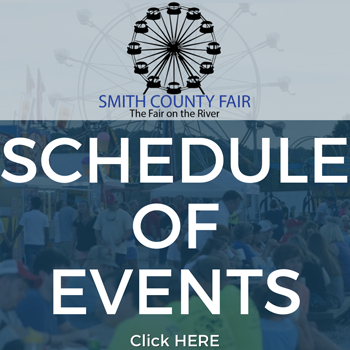 You can also find the Smith County Fairest of the Fair on Facebook!